A tabernacle -found at the head of the church, usually behind or next to the altar. 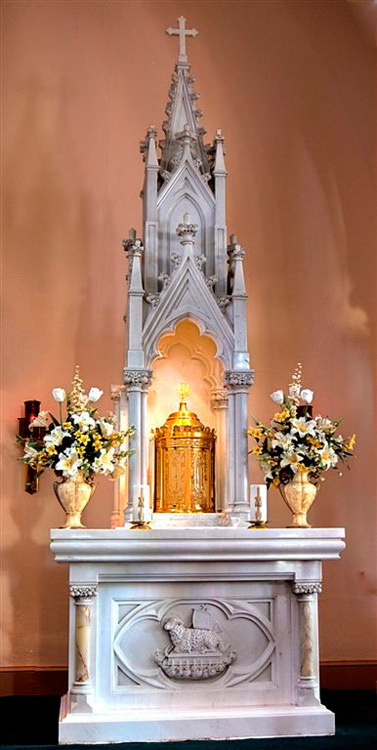 Catholics believe in transubstantiation, where Christ becomes literally present in the Eucharist, so the consecrated bread and wine can only be stored in a tabernacle which has been blessed. A crucifix, usually either outside, in front of the church, or hanging on a wall, but some churches will show the crucifix in a stained glass window. Kneelers - attached to the back of each pew, so as to be used by those in the pew behind it, as a Western Catholic mass involves sitting, standing, and kneeling at different points in the service. While many Eastern Catholic churches may have kneelers, they are only used for services during Lent. The First Ecumenical Council declared kneeling on Sunday to be prohibited, as it was meant to be a time of joy, rather than repentance, so parishioners will only sit or stand. In many of the more traditional Eastern churches, there will not even be pews, so that parishioners stand during the entire Divine Liturgy (equivalent of a Western mass). Votive candles - candles found by a statue or painting of Jesus or a saint. People light the candles as a prayer for someone, or in memory of someone. The candle serves as a visual reminder of the prayer or memory. Catholic churches are often designed to be very eye-catching and ornate, although there are several smaller churches with less ornate decoration. Inside, some (usually cathedrals and the larger churches) have a cruciform shape; when looked at from above, they resemble a cross, with the nave and chancel forming the trunk of the cross and wings on either side of the chancel forming the two arms. Many churches will be built with the sanctuary in a semi-circle around the altar. The chancel in cathedrals is often separated from the sanctuary by a railing. Cathedrals are usually decorated with mosaics, stained glass, marble, etc. Many churches have stained glass windows and paintings, but, in the case of Roman Catholic churches, rarely to the extent of cathedrals. What really differentiates a church from a cathedral is that a cathedral is the Episcopal See, or seat of the bishop of a particular diocese. The "cathedra," or seat of the bishop, is housed in the cathedral, and only the bishop may sit in this chair. Stations of the Cross - paintings or carvings depicting different events in the trial and crucifixion of Jesus, hung on the walls around the sanctuary. During the season of Lent, the 40 days before Easter, churches will hold Stations of the Cross devotions or prayer services each Friday, to remember the suffering of Christ. Holy water - fonts found directly inside the entrance to the church, parishioners dip their fingers in the water and then cross themselves as they enter. 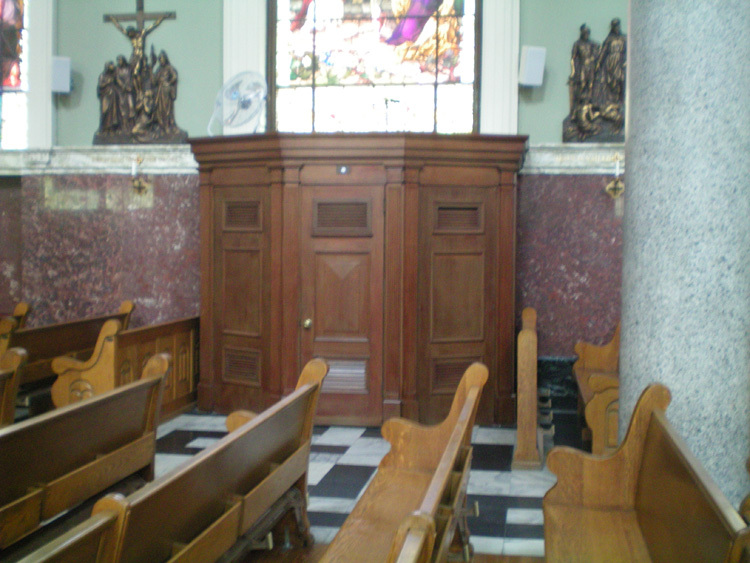 Confessional - as the sacrament of confession, or reconciliation, is key to the Catholic faith, there will be a confessional somewhere in the church. Occasionally, these will be along the sides of the church, and obvious, but other times, they are merely behind a door which, from the outside, may simply appear to be a closet. Statues of Jesus, saints associated with the church, etc. 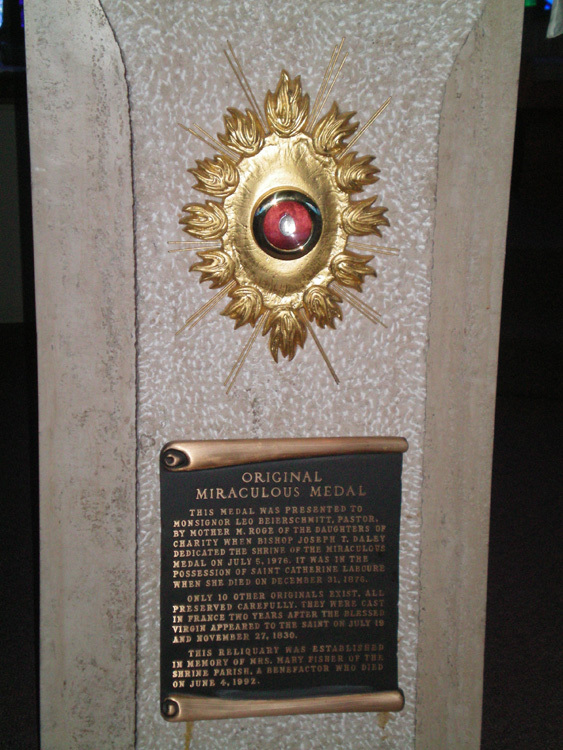 Dedicated in 1976, Saint Catherine Labouré is one of two places in the United States to house one of the surviving Miraculous Medals; the other is in Philadelphia. As such, it is a destination for some pilgrims. The most striking aspect of the church is the windows, which were designed by Gabriel Loiré, and are called a Symphony in Blue. They depict St. Catherine's vision of Mary, the crucifixion, and the seven sacraments. The original parish church under the title of St. Patrick, when Harrisburg was still part of the Archdiocese of Philadelphia, was built in 1826. In 1868, the 15 county area in south central Pennsylvania was made into its own diocese, the Diocese of Harrisburg. 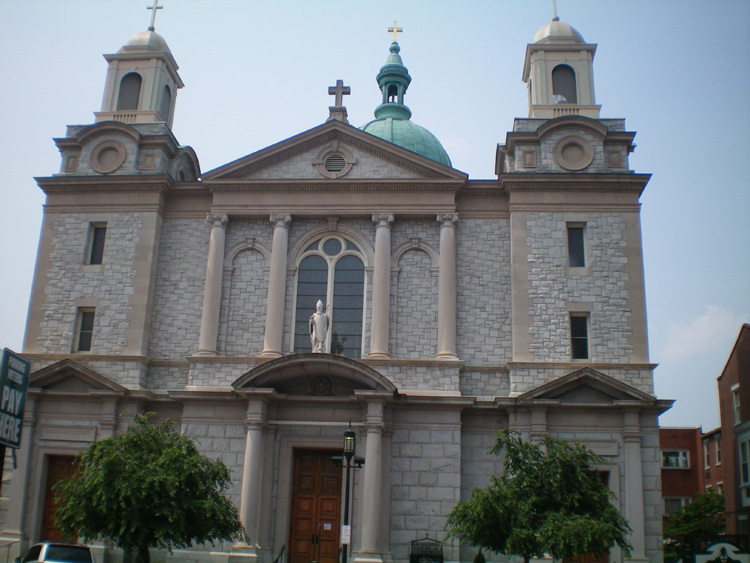 Saint Patrick Church in Harrisburg was named the "pro-cathedral," meaning it would house the Bishop's Cathedral until a permanent Cathedral could be built. The current cathedral was begun in 1904, and since its completion in 1907, has undergone multiple renovations, with the most recent in 2006. All renovations have been carried out through donations from parishioners. Iconostas (Icon Screen) - found in both Eastern Catholic and Eastern Orthodox churches, the iconostas is the meeting of the earthly (the nave) and the heavenly (the chancel). Three types of doors make up part of the iconostas: the north and south Deacon's Doors, used by the priests and deacons as an exit and entrance, respectively, during the Divine Liturgy; and the Royal Doors in the center, which are used only by the priest, and only at certain times in the Divine Liturgy. The iconostas is usually made up of three tiers, although sometimes, only two tiers are used. On the first tier are, from left to right, St. Nicholas, Patron of the Byzantine Catholic Church; the North Deacon-s Door, with an icon of St. Michael the Archangel; the Theotokos (Virgin Mary) holding Baby Jesus; the Royal Doors, depicting the Annunciation; Christ the Teacher; St. Stephen, the first Christian martyr; and the Patron(s) of the particular parish. The second tier depicts the twelve major feast days in the Eastern Church, with an icon of the Mystical Supper in the center. The third tier, if there is one, shows the twelve apostles. 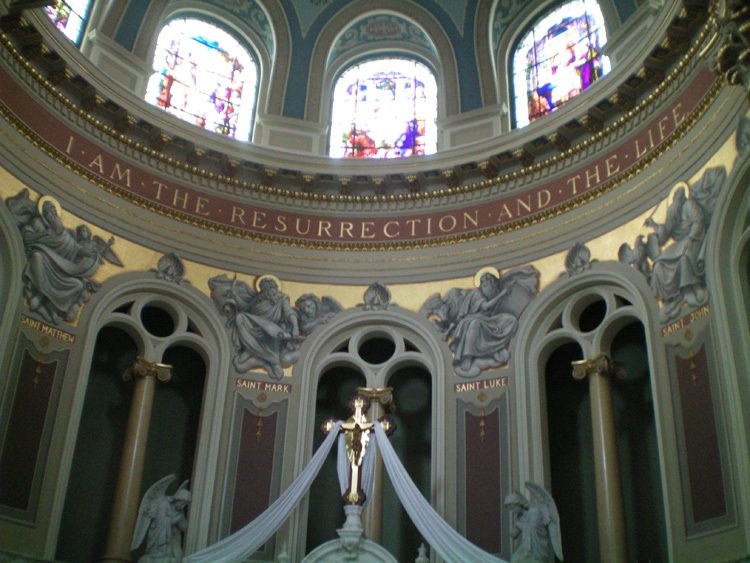 If there is no third tier, the apostles are usually painted or shown somewhere else above the altar. Table of Preparation - where the priest prepares the gifts (the bread and wine) before the Divine Liturgy, when they will become the body and blood of Jesus. This rite of preparation is called Proskomedia. Tetrapod - a small, four-legged table at the front of the church, on which an icon of a feast or patron saint(s) is placed. Upon entering the church, members go to the tetrapod, bow, make the sign of the cross, and kiss the icon in veneration. 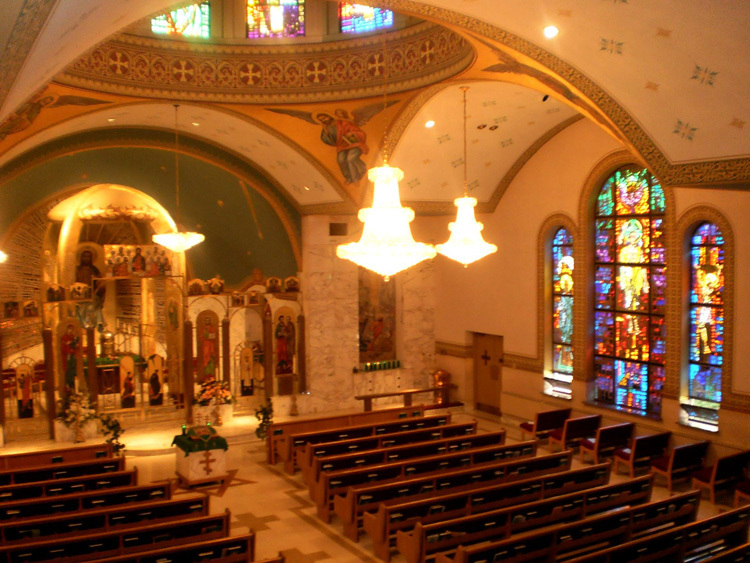 Unlike Roman Catholic churches, where confessionals mean the parishioner might sit behind a screen during confession, Eastern Catholic churches have face-to-face confessions, and so do not use confessionals. 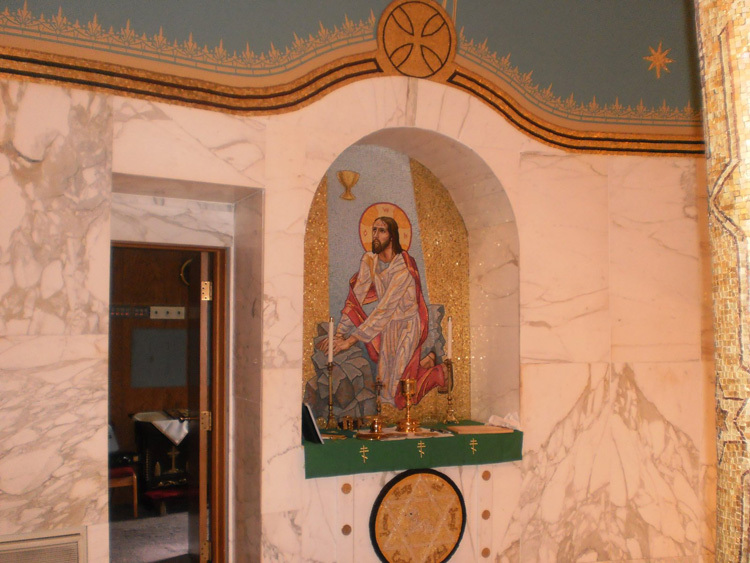 Instead, in the Eastern tradition, confessions take place in the priest's sacristy or behind the altar, in front of an icon of Christ. Additionally, with the exception of the Eucharistic Prayer and the homily, the entire Divine Liturgy is intoned or sung. 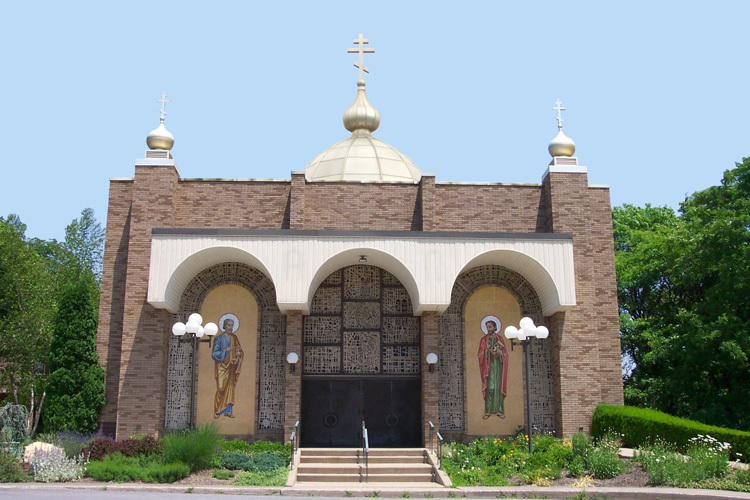 The church was originally begun as a branch of St. Michael the Archangel Byzantine Catholic Church, which served almost an entire county at the beginning of the 20th century. In order to make it easier to participate in the Divine Liturgy, several mission parishes were begun, and the first church building of Ss. Peter & Paul Byzantine Catholic Church was dedicated on July 4, 1918. 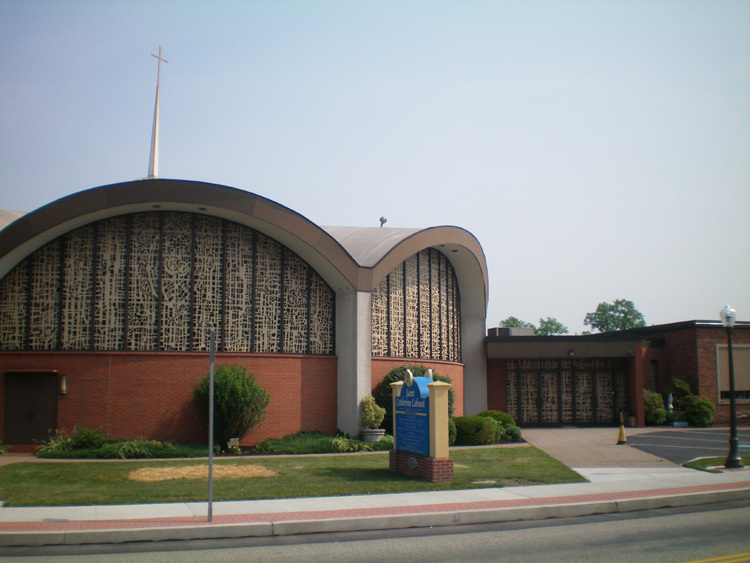 After several decades of growth in membership, the church moved to its current location to accommodate its increasing numbers, and the new building was dedicated in 1976. In the late 90s, the church began to return to many of its traditional Eastern practices and services, many of which had been dropped over the decades, and in recent years, more traditional and accurate translations of the services, as well as services for Great Feasts have been restored. The church also underwent major renovations in 2002, bringing it to its present appearance. 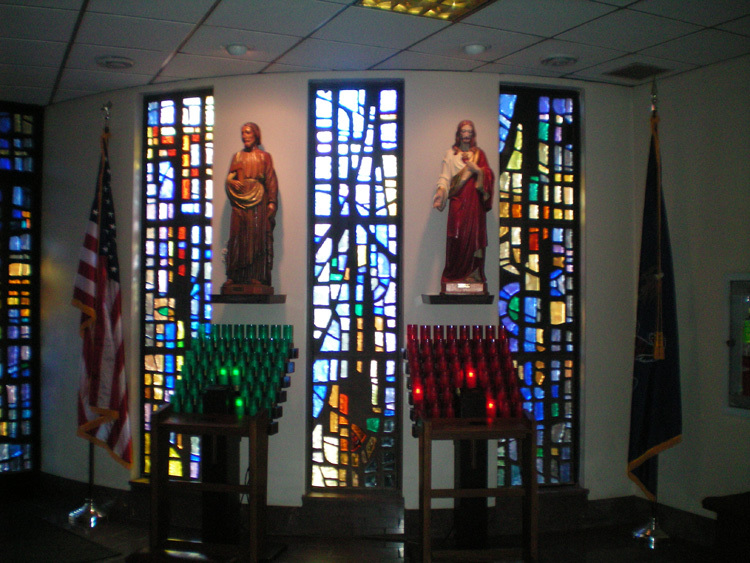 Votive candles before statues of St. Joseph and Jesus, at St. Catherine Laboure Roman Catholic Church in Harrisburg. 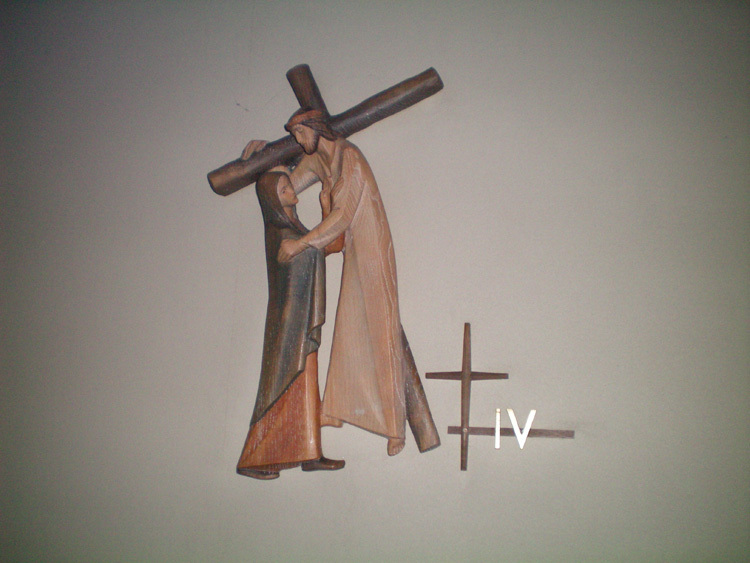 Station of the Cross at St. Catherine Labouré representing the sixth station: Jesus Meets His Sorrowing Mother. 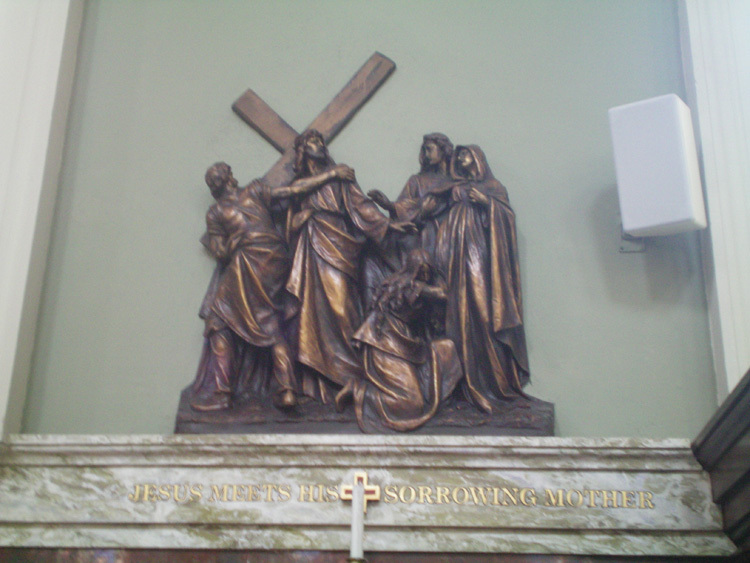 Station of the Cross at St. Patrick's Cathedral representing the sixth station: Jesus Meets His Sorrowing Mother. Confesssional at St. Patrick's Cathedral. Paintings of the writers of the four Gospels, Ss. Matthew, Mark, Luke, and John, above the altar. St. Catherine Laboure Roman Catholic Church in Harrisburg. The windows are called A Symphony in Blue. The iconostas and tetrapod at Ss. Peter and Paul Byzantine Catholic Church in Portage. Table of Preparation at Ss. Peter and Paul Catholic Church. The interior of Ss. Peter and Paul Byzantine Catholic Church, taken from the choir loft. 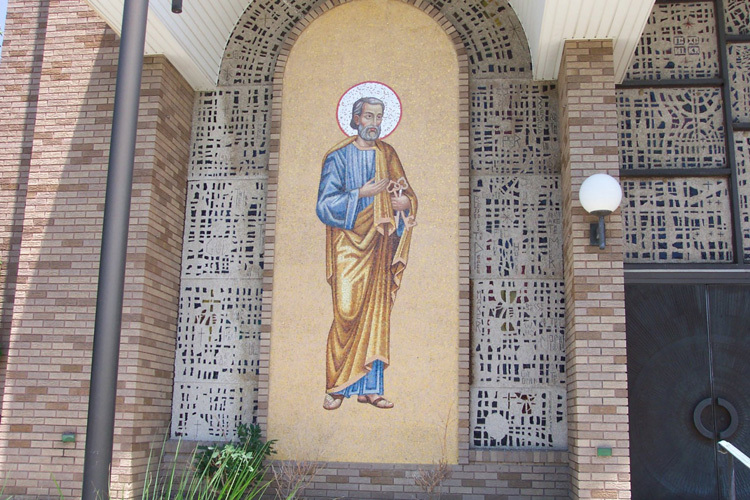 A mosaic of Saint Peter, one of the church's Patron Saints, to the left of the front door. On the other side is a mosaic of Saint Paul. Tabernacle at St. John the Evangelist Roman Catholic Church in Portage. St. Catherine Labouré is home to one of the only original Miraculous Medals to still exist, created at the request of St. Catherine Labouré, after her vision of the Virgin Mary.